Be sure to click on any shopping link to ensure that you're participating in my Tupperware Online Party. My Tupperware Online Party will last until Aug. 12, 2008. If you have any questions, please let me know. Or you may visit my Tupperware Consultant's Web site, Wendy Leal. Tupperware Round Cake Taker on Clearance! Tupperware Round Cake Carrier is on Clearance right now for only $18.99! You save 40%!! This round cake taker is in the discontinued beautiful Caribbean Blue color! To order this Tupperware cake taker please visit my Tupperware website http://my.tupperware.com/hostapartyonline and click on the Tupperware Clearance link and then click on the Cart Icon and you will see it on that page. 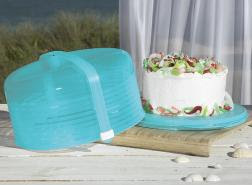 This Tupperware Round Cake Carrier will sell out fast so get it now if you want it!!! Tupperware Sale - Look What's New! By purchasing Tupperware you are helping to save the enviroment from throw-away plastic containers, plastic baggies, water bottles and more. Tupperware plastic containers carry a lifetime warranty and yes, sometimes they do break but I know that you would agree that Tupperware seems to last a lifetime! I hear all the time from people that they still have their Grandma's Tupperware products! But how about those plastic grocery bags from the stores? Now those pose a very big problem, more than I ever realized. I am a culprit too... I take the easy way out and throw my groceries in those disposable plastic grocery bags. This morning I was reading online about the damage it is doing to to the enviroment on this website and on the National Geographic website. I learned that The U.S. uses 100 billion plastic bags annually, consuming about 12 million barrels of oil. Less than 1% of plastic bags are ever recycled and from those that are, we are spending more money on the energy to recycle them than they are worth. China and Rwanda have banned plastic bags. San Fransisco has become the first US city to ban plastic bags. What is our problem? Better yet, What is our solution? Cloth grocery bags are sturdy and easy to clean. Just throw them in the washing machine! You can find these bags in most grocery stores now. Get yourself some and USE THEM!! Keep them in your car where you will see them when you are out shopping! Most of us will need more than one but the cloth bags can all be stuffed into one! Want to be a little more stylish? Here are some links to custom made cloth grocery bags that I found! Ebay Re-usable cloth grocery bags - Many people are working from home using their sewing talents to sell these really neat cloth grocery bags! Check them out! Find 1000's of Earth Day Tote Bags on CafePress! You can even make your own tote bag with anything you would like it to say! If you see a neat saying in any of the products like shirts, cups, etc. Click on the "more products" link and you will be able to see if there is a tote bag available in that saying!! This is pretty cool! You can even make money by creating your own sayings and selling them on Cafe Press! Be sure to click on any shopping link to ensure that you're participating in my Tupperware Online Party. My Tupperware Online Party will last until Jul. 21, 2008. If you have any questions, please let me know. Or you may visit my Tupperware Consultant's Web site, here. You can register your own online party too! Just visit http://my.tupperware.com/hostapartyonline and click on the F R E E Tupperware banner!